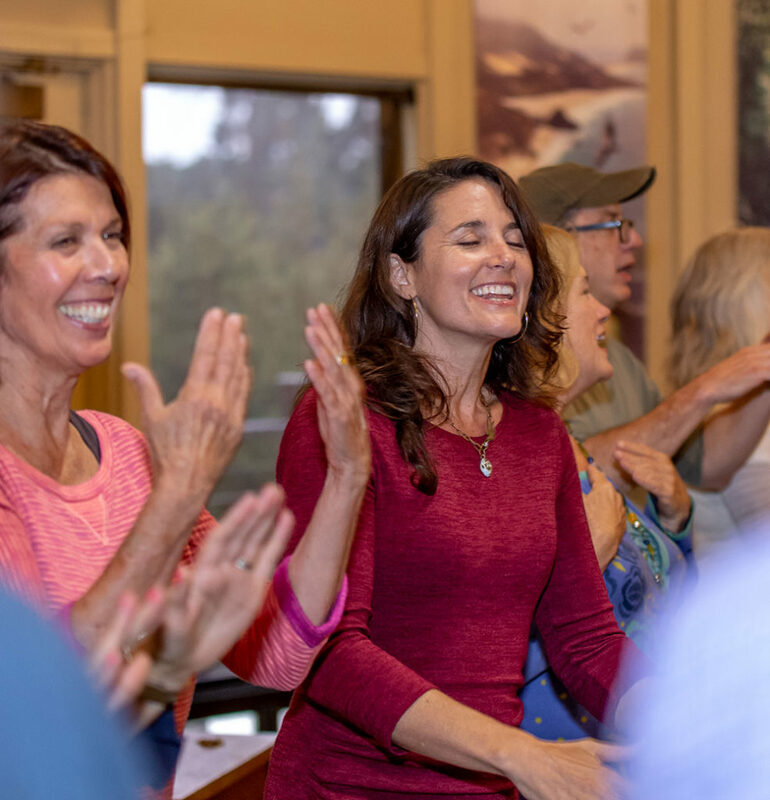 Lisa leads weekly community singing classes on the Central Coast of California. These classes are held most of the year, open to the public, and require no experience. Mondays and Wednesdays are community singing classes that fold into the Wholehearted Chorus. Tuesdays are a more intimate, restorative and devotional drop-in singing offering held in Carmel. Find details about each below, and check the Google calendar below for the most up-to-date information about current class offerings. 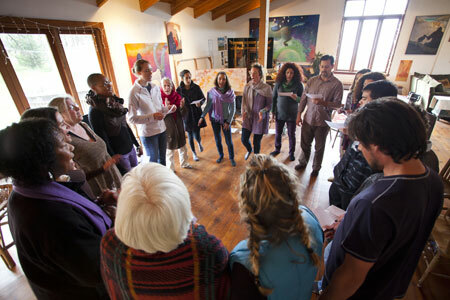 All singers are welcome at either or both of these weekly Monterey and Big Sur classes. Each spring and fall, these Monday and Wednesday classes fold into seasons of the Wholehearted Chorus, culminating in two season concerts with the combined Big Sur & Monterey communities. New singers are welcome to drop-in at any time. Songs in these classes are learned by oral tradition and come from diverse traditions around the world. These classes are offered by sliding-scale, sustaining donation – $10-20. Join this group and leave a review on Meetup.com. The Grange is located on the west side of Highway 1 just south of Ripplewood and the Big Sur Roadhouse. Heading south from Carmel, you’ll pass the Roadhouse then cross a very short bridge over Juan Higuera Creek. Take an immediate right onto the paved driveway and follow the pavement to the right to the Grange. Songs of the Spirit is a drop-in class with a focus on sound meditations, chanting and songs with a healing & spiritual focus. Each class ends with a sound healing bath. Bring a blanket if you can. All voices are welcome. Classes on the second Tuesday of each month are led by Lisa, all other classes are led by Cynthia Fernandes. These classes are offered for a drop-in of $10, or a punchcard of 10 classes for $80. 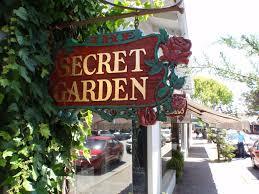 The Secret Garden is located behind Pilgrim’s Way Bookstore on Dolores St. between 5th and 6th. Enter through the Pilgrim’s Way Bookstore. See map below. There is ample free parking on the street. Please note we lock the door after class begins at 7pm. Don’t hesitate to call the number on the door if you arrive late and we’ll let you in. Click on any item in the calendar for details. Please give yourself time to find street parking. No commitment is required – you may come once or every week. Most singers come consistently and find it fulfilling to learn songs over time. During the fall and spring seasons of the Wholehearted Community Chorus (Monday & Wednesday classes) we recommend consistent attendance if you wish to learn the more complex songs we share in season concerts. Lisa knows more than 300 songs from a wide variety of genres that can be taught by oral tradition. Most are sung in 2-4 part harmony. There is no sheet music and no musical experience is required. We are constantly learning new songs, most of which are relatively simple and instantly fulfilling for beginners and veterans alike. We sing a diverse mixture of traditional chants & rounds from around the world, spirituals, gospel, traditional and contemporary folk, pop and original compositions from Lisa and many talented members of our singing community. In the Tuesday classes, Songs of the Spirit, Lisa teaches songs that are generally simpler, more repetitive and have a healing or spiritual focus. During the fall and spring seasons of the Wholehearted Chorus (Monday & Wednesday classes) we sing more diverse and complex songs, using lyric sheets and practice recordings to support learning. It's amazing how people sing out and even do their best when they just feel free ``like birds`` to sing and have fun. No one is yelling at them to raise their pitch, etc. People under Lisa's leadership seem to naturally be in musical harmony. I am blessed to have a beautiful singing circle here in Monterey at last! I consider it my song sangha! The leader is Lisa Goettel. She is lovely, sings like a bird, with such a generosity of spirit and is a very skilled and delightful teacher. She is spreading the joy of singing together around the world and making these songs accessible to all. I find it strange that with all the psycho-therapeutic modalities I've explored, I never really put singing together with healing. How did I miss that ? (rhetorical) There was a moment during last weeks class that Lisa said (in a rather quiet voice) ``We're Healers.`` That was the moment it crystallized. Lisa is a whiz at bringing out the best in us with a Buddhist approach - total acceptance, no judgment, great support, empathy and compassion. My friends at our spring concert were wowed and loved it all - they all commented on the great assortment of songs, the fact that we all seemed to be in complete joy and that they were infected by our passion. I feel like I’ve found my heart’s home with all of you. Lisa and her vision are a gift from the Divine.